Ribbed Ripple / Turtle Beach is an original crochet pattern by June Gilbank. The gentle waves of this ripple are highlighted by the ribs at the edge of each stripe. The Ribbed Ripple stitch pattern works up into a beautiful blanket with a wave stripe repeat in any 2 (or more) colours, or make the Turtle Beach version with sand and sea colours, either as an afghan square, a playmat for aquatic toys, or a full blanket. Use the optional edging instructions to square off the rippled top and bottom edges, so you can e.g. use this as a square in a larger blanket, or turn it into the front of a cushion cover. Size: any size blanket/square of your choice, but the pattern includes specifics to make a 10"/25.5cm square and a 3ft x 4ft (36x48”, 91x122cm) blanket. Please note: to complete a Turtle Beach blanket, you'll also need some turtles! The Baby Sea Turtle Collection pattern is for sale separately, from my shop. And you can also add starfish from my Starfish Collection pattern (again, sold separately). The modifications required to turn my Hatching Turtle (from the Baby Sea Turtle Collection pattern) into a Swimming Turtle that looks like the back half of its shell is submerged. 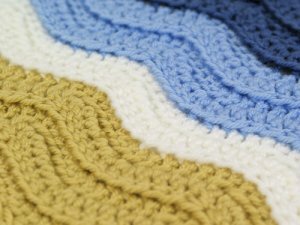 Optional edging instructions to square off the rippled top and bottom edges, so you can use this as a beach-themed square in a larger blanket, or turn it into the front of a cushion cover, for example – and there are lots more applications. Any-size modification instructions, so you can make any size afghan square, a baby blanket, or even a huge blanket to fit a king-sized bed! NEW: A two-page appendix of extra bonus content: popular modification ideas (including the puffy 3-dimensional seafoam addition to the blanket shown in the last photo in the image gallery, my favourite way to attach the turtles, and more) and troubleshooting tips for the blanket and turtles. Send me a donation and receive the easy-to-print value-packed PDF version of the pattern as a thank you! Date Added: 02/09/2019 by Janie V.
Date Added: 01/01/2019 by Beth T.
Date Added: 07/06/2018 by Pam M.
Date Added: 09/18/2017 by LaHonda T.
Date Added: 08/29/2017 by Phyllis D.
This pattern is easy and can easily be varied (changed colors) to make different blankets. Date Added: 08/29/2017 by Pam D.
Date Added: 08/29/2017 by Kathryn C.
Date Added: 08/29/2017 by Sherry O. This pattern was easy to follow. The finished Afghan is beautiful. Date Added: 08/29/2017 by Mary D.
Such a cute blanket idea. Made for my surfer and sea lover son in law! Date Added: 08/25/2017 by M Kathleen W.
Love this afghan!! So easy to follow.